A tunneling project in London awakened an unearthly fire-breathing beast from its centuries of slumber and all hell broke loose. Twenty years later, fierce dragons dominate the air, burning the land and feeding on the ashes. Mankind has been driven underground for years and the situation seamed hopeless until scientist discovered the "Achilles heal" of this new species ... there is only one male dragon. With this information a group of would be dragon-slayers begin a perilous crusade to hunt down and destroy this "alpha-male" and end his Reign of Fire! Background: Before the militia has arrived, the dragons wreak havoc on a small enclave of disheveled humans -- who lack the firepower to truly defend themselves -- taking refuge in an abandoned castle. Objective: Each player aims to defeat the other. Battle-force Size: Two-player game; (randomly determine who plays which battle-force). The Dragon player can use any "Mature" Mage Knight Dragon 300+/- point value vs. the Human player's battle-force of 200 points of MechWarrior Infantry & Vehicles (no VTOLs or 'Mechs) and 200 points of Mage Knight Castle section(s); three orders per turn. Time Limit: 60 minutes (or when the Dragon dies or all the Human's units are eliminated). Preparing the Battlefield: 3 feet x 3 feet battlefield. The Human player must set up all of his units and Castle section(s) first. 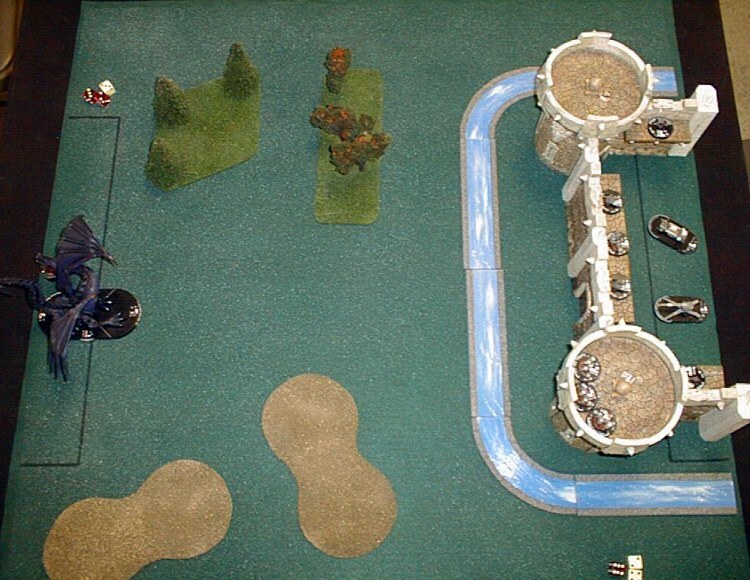 Once the Castle section(s) have been placed, players prepare the battlefield as per the MW:DA standard rules. Infantry units upon the Castle section(s) nullify the Dragons height advantage modifier. Castle section(s) are abrupt elevated terrain accessible by units with jump jets. 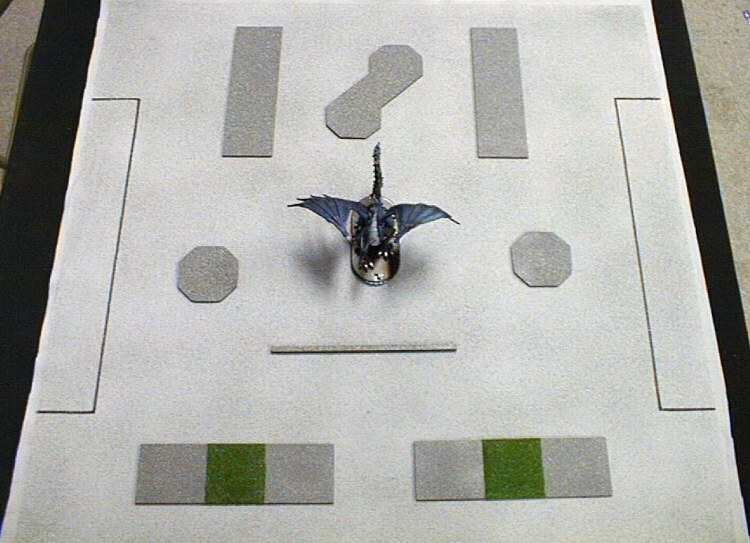 Then the Dragon player may places his or her dragon anywhere on the battlefield, even within range (but not in base contact) of the Human player's units and/or Castle section(s). After setup, the Dragon player is then the first player. Victory Conditions: The Dragon player scores double points for any eliminated units or destroyed Castle section(s). The Human player receives the point value of the Mature Dragon when it is eliminated. Keep track of all points scored to determine which side you will play in the third and final scenario. Background: The ragtag militia group has arrived, with the much needed arms and intelligence reports of the dragons Achilles heal (see story-line background above). The new Human player begins a dangerous crusade to eliminate the alpha-male dragon once and for all ... but their convoy gets ambushed along the way. Battle-force Size: Two-player game; (players switch sides). The new Dragon player can use two "Young" Mage Knight Dragons 200+/- point value each vs. the new Human player's battle-force of 400 points of MechWarrior units. The new Human player must have at least one of each unit type ('Mechs, Vehicles and/or VTOLs & Infantry) in his or her battle force; four orders per turn. Time Limit: 60 minutes (or when the two Dragons die or all the Human's units are eliminated). Preparing the Battlefield: 3 feet x 3 feet battlefield. 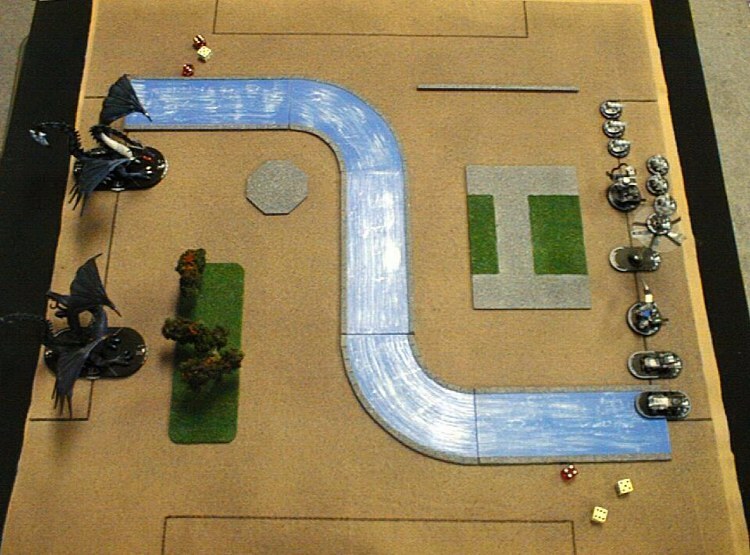 The Human player must set up all of his units first along a 3 inch x 36 inch "roadway" deployment zone that runs throughout the center of the battlefield. Players prepare the battlefield as per the MW:DA standard rules, but no terrain can be placed inside the "roadway" deployment zone. 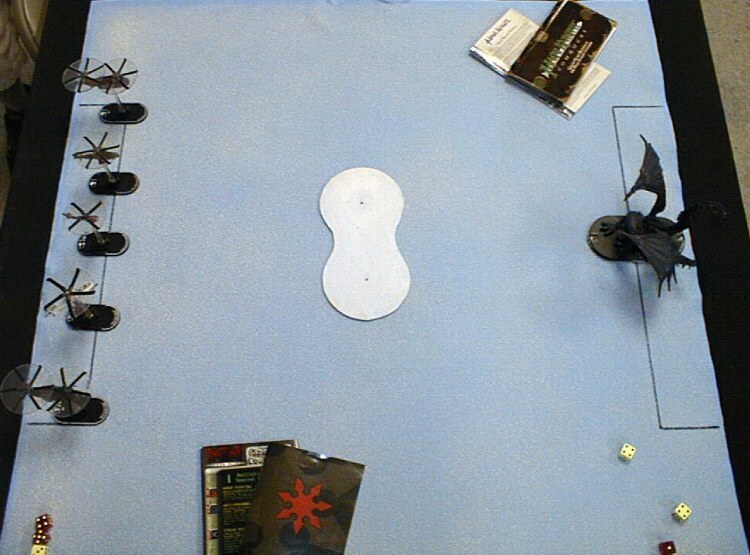 Then the Dragon player may place his or her units anywhere on the board, even within range (but not in base contact) of the Human player's units. After setup, the Dragon player is then the first player. Victory Conditions: The Dragon player scores points for any eliminated units. The Human player receives the points for the two Young Dragons when they are eliminated. Add these points to your scenario #1 totals and the winner then chooses which side to play in scenario #3. If there is a tie ... use the optional scenario below. If there is a tie in the total points from scenario #1 & #2, play this optional scenario before scenario #3. Background: In an attempt to avoid another ambush, the humans send their crack-squad of VTOLs against the dragons. A deadly dog fight in the air ensues ... only one species can survive. Battle-force Size: Two-player game; (randomly determine who plays which battle-force). The Dragon player can use any "Young" Mage Knight Dragon 200+/- point value vs. the Human player's 200 points of MechWarrior VTOLs; two orders per turn. Time Limit: 60 minutes (or when the Dragon dies or all the VTOLs are eliminated). Preparing the Battlefield: 3 feet x 3 feet battlefield. Randomly determine the first player. Neither player gets the height advantage modifier. No terrain is placed on the battlefield, but clouds can be used as hindering terrain. Victory Conditions: The Dragon player scores points for any eliminated VTOLs. The Human player receives the points for the Young Dragon when eliminated. The winner then chooses which side to play in scenario #3. Background: The haggard militia group of dragon-slayers finally arrives in London. The once regal capitol is now a destroyed cityscape of burning debris and rubble strewn streets. The general location of the alpha-male's lair is easily determined by watching the dragons cannibalize themselves for the lack of food. Once he lands, the militia moves in for the kill ... the fate of all mankind weighs heavily upon them. Battle-force Size: Two-player game; (players determined in scenario #1 & #2 above). The Dragon player can use any "Ancient" Mage Knight Dragon 450+/- point value vs. the Human player's MechWarrior battle-force of 500 points; four orders per turn. Preparing the Battlefield: 3 feet x 3 feet battlefield. The Dragon player places his unit first, confined to the center-point of the battlefield. Players prepare the battlefield as per the MW:DA standard rules with double the amount of terrain. Abrupt elevated terrain is acceptable; units with jump jets may move onto of these buildings (which will nullify the Dragons height advantage modifier). Then the Human player may place his or her forces in any of the four bordering deployment zones. After setup, the Human player is the first player. Victory Conditions: The Dragon player scores points for any eliminated Human units. The Human player receives the point value for the Ancient Dragon when it is eliminated. A special thanks to the "Reign of Fire" story-line, copyright Spyglass Entertainment, 2002.